Grist for the Mill: Dawn Zimmer for council? Put this one in the "huh?" category but the rumor is out there in the bushes around the rain gardens. Former mayor Dawn Zimmer who departed mid-mayoral race in June of 2017 as she said to fight President Trump's global warming is rumored to be a fourth ward council candidate this November. After holding reform backing for a third term as mayor and hosting a big fundraiser back in April 2017, Zimmer suddenly went behind closed doors handing the baton to Ravi Bhalla that June and crushing the successful Reform Movement coalition. Bhalla would go on to win with 32% of the vote in an ugly and highly partisan four-way election with the vile Ravi Terror Flyer. fourth ward city council." Again? In less than two years after her sudden departure, questions will fly and rumors will abound. What prompted another entry back into Hoboken politics? Are rain garden sales not going well with the Secaucus energy firm where she's been working? Is she going to try to keep a closer eye on Ravi Bhalla who reigns more like a Hudco boss than a reformer? Did Zimmer already fix global warming after President Trump exited the do nothing US money-grabbing Paris Accords? Or has she already seen enough nationally with America's soaring economy, booming employment and ending of global wars culminating in first-ever successful peace efforts with North Korea? Maybe she wants to spruce up the Southwest Plaza, the most expensive acre in Hoboken at approximately $10 million re: the southwest park? Or does she want to keep an eye on Ravi Bhalla who was looking to do a big development tower in the fourth ward across her street? People say that wasn't going over too well as Zimmer and her husband were more than a tad unhappy hearing of the proposed tower. Hey Dawn, get NIMBY with it! Should Zimmer cast her lot vying for the Hoboken fourth ward, expect smiles with Ravi Bhalla publicly. Who knows how such a formula would fare privately. Councilman Ruben Ramos entrenched in the position is the most likely candidate to succeed in November. In 2013, Ramos went toe to toe with Dawn Zimmer in the fourth ward during the mayoral race. They were almost dead even on the machines in the fourth ward with Zimmer winning citywide in a three-way mayoral race. This time it would be a fourth ward battleground where the edge would go to the incumbent. No, not Dawn Zimm-uh but Ruben Ramos. Some think the real reason Dawn Zimmer unplugged her bid for a third mayoral term was connected to lawsuits, specifically the Carmelo Garcia ethnic cleansing civil suit. After years of iterations and being thrown out of Hudson Superior Court, it was refiled and then quietly settled for $700,000. The full bill was hoisted on to the Hoboken Housing Authority with the 2017 mayoral race going full blast. It certainly could become an election issue. MSV broke the story of the shocking lawsuit settlement shortly after the 2017 election. Now it's 2019 and Hoboken could see a repeat of a former mayor in Dawn Zimmer make a bid to return to the City Council. Former Hoboken mayors Steve Capiello and Anthony Russo did the same maneuver. Will it happen again? Grist for the Mill is MSV's rumor column but its success makes it the most popular column in all the Mile Square City. Have a tasty carrot for Horsey? Send it to smartyjones@me.com and be assured your confidentiality is protected with MSV's State of NJ Shield Law protections upheld repeatedly in Hudson County Superior Court. Let's go to the Hop? Next month a number of changes to local parking rules are set to take place. A new visitor pass will be easier to obtain online, a nod to common sense taking a 21st-century hold in Hoboken City Hall with what's being called a "virtual" visitor system. 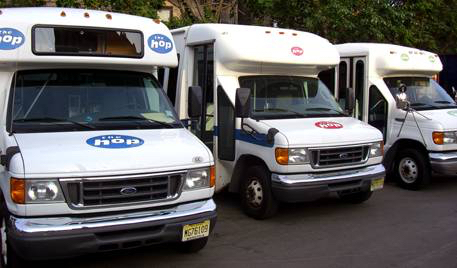 Then there's the City Hop bus system. The one-dollar fare will drop to zero beginning March 4th. What impact this has on a beefed-up system remains to be seen. There are 55,000 people in Hoboken so one can only imagine how this supply-demand equation turns out. The Hudson County View published more of the details. Talking Ed Note: Meanwhile, the MSV exclusive of a major budget deficit and tax increase dilemma is seeing nothing but radio silence out of the mayor's office. There's nothing by way of official comment, pushback, trolling or a restart with a fresh round of face punching. Doesn't John Allen have any more friends who can sign on to one of his specious "ethics" complaints? Also dead quiet, any response to Hoboken residents asking what Ravi Bhalla will do about the proposed gas burning North Bergen Power Plant. An APB was issued on Councilman Jim Doyle's resolution in opposition after Ravi Bhalla killed it. It looks more and more like a cash deal was brokered in a HudCo back room between HudCo's Uncle Nick and Ravi Bhalla. Fundraiser! Fundraiser! Follow the cash. Even Shadowstan numberscruncher is as silent as a zombie wandering aimlessly among the Ravibot Walking Dead. His Lindastan trans persona brayed incessantly about the Jim Doyle resolution and how the City Council must pass it. Now they are quiet on that and the Hoboken budget deficit as they wipe the egg off their political operative zombie faces. Guess that shadow numberscruncher ain't so good at crunching numbers. Hey, anyone see Ravi Bhalla? Has he gotten back from his latest fundraiser with Uncle Nick? Mayor Ravi Bhalla hailed the release of his mini Sandy Ocasio-Cortez-Castro green plan last week. Intended to appeal to the crunchy granola crowd, it lacked the pizzaz some among the Hoboken public expected. "our municipal operations no longer depend on fossil fuels such as coal and petroleum that produce substantial greenhouse gas emissions and wreak havoc on our environment." 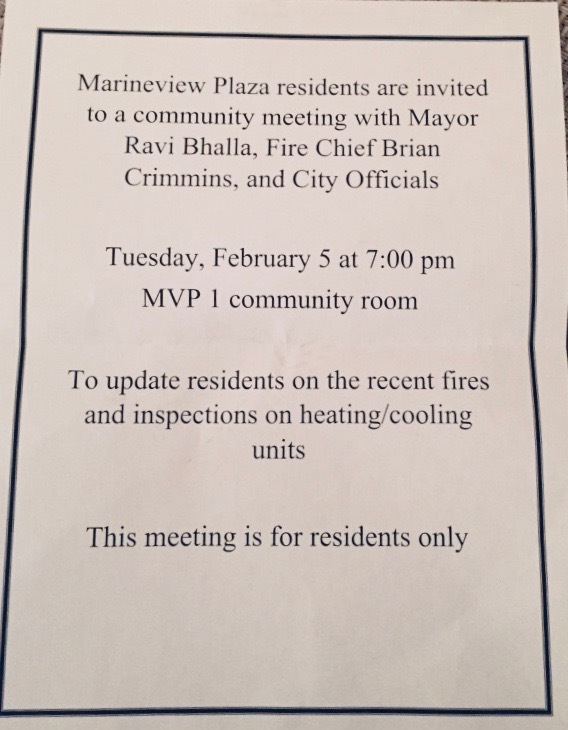 So what is Mayor Ravi Bhalla doing about the North Bergen Power Plant? As MSV exclusively reported, Councilman Jim Doyle prepared a resolution for the City Council last October against the North Bergen Power Plant. Ravi Bhalla yanked the resolution off the agenda and then attended a ball for North Bergen Mayor Nick Sacco. "And we need the Hoboken City Council to vote against this Plant as well. They were supposed to multiple times, but each time removed it from the agenda. What's the hold up???" No one's seen or heard a peep out of Jim Doyle's resolution since. One can assume Emily Jabbour will not be promoting or sponsoring that resolution now either. On Ravi Bhalla's facebook page, the issue has been raised several times. He must be to busy counting the money from a fundraiser where Uncle Nick's top political operative, Joey "the Nose" Munoz aided the effort by having the Bhalla fundraiser sent out near and far to Uncle Nick's Hudco pals. CBS covered the issue after the Jim Doyle resolution disappeared into the ether of another HudCo - Ravi Bhalla deal. Talking Ed Note: Hudson County which has rocketed in recent years to the highest portion of Hoboken taxpayers' annual bill is sure to hit the Mile Square City again this year. Don't expect Ravi Bhalla to do anything about that as he has his own budget deficit to contend with as exclusively reported yesterday. There's not been any "political action" on any of this by Ravi Bhalla. Back room deals are too good! Reliable sources indicate Hoboken's budget this year looks dire for Mile Square City residents. 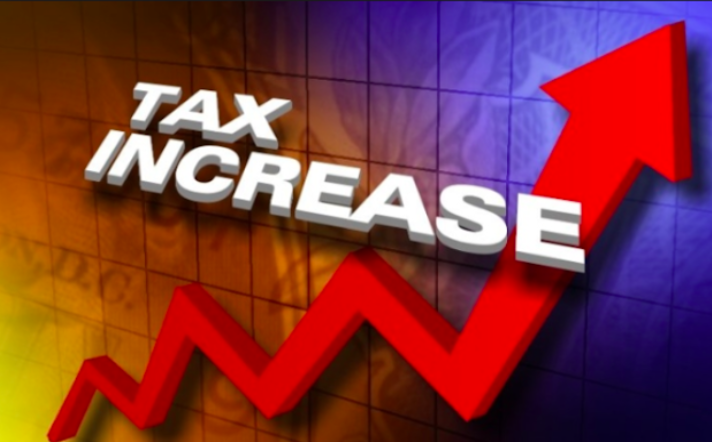 Word of a deficit running into the millions of dollars is causing major agita as a major tax increase looms. One reliable source connected to the mayor's office stated matter-of-factly, "there is panic in City Hall about the deficit." The source asked for anonymity for fear of retaliation from the "Face Punchers" in the mayor's office. Other sources confirmed the budgetary dilemma unfolding under Mayor Ravi Bhalla with one saying it's running into the millions, near double digits. "We could be looking at $8,000,000 before efforts by the Bhalla Administration begin trying to whittle it back," said another. Hoboken's 2018 budget came in at over $118 million, much of it tied in fixed municipal and public safety costs. The panic is causing seizures inside the mayor's office where a major tax increase looms and would be presented to the Hoboken City Council this spring by the Bhalla Administration. Double-digit pay raises to the "Face Punchers" in the mayor's office with a $300,000+ annual payout to three political operatives focused on "Face Punching" any believed opposition. Efforts to reduce a sizable deficit approaching double digits in the millions are under examination but others in City Hall think it's too little, too late. One source believes the mayor's office is asking each department head to bring in a 2019 budget with a 10% reduction from the prior year. Request for comment from the mayor's office was submitted late Sunday night. Recent questions not favorable to the Administration here and on other news sites have been ignored. Most recently, there's been no answer to significant questions related to Ravi Bhalla's second job with a Republican law firm where tens of thousands in legal contracts flowed late last year. Talking Ed Note: Last week, Ravi Bhalla announced a green plan pointing to 9% energy savings in Hoboken municipal space in upcoming years. The plan failed to acknowledge nor address major opposition in the area by residents and regional mayors for a natural gas power plant by North Bergen. A resolution against the North Bergen power plant sponsored by Councilman Jim Doyle was pulled off the City Council agenda last fall, reportedly by Ravi Bhalla. In its place, Bhalla attended a ball for Nick Sacco, the North Bergen mayor in October. In recent weeks, Bhalla reportedly held two private meetings with Nick Sacco. Some believe the Jim Doyle resolution against the North Bergen power plant was permanently buried in exchange for backroom political considerations favorable to Bhalla. One such Bhalla consideration is aid to his recent political fundraiser by Sacco's chief political operative Joey "the Nose" Munoz. A TV actor is in custody this morning in Chicago, a "victim" of truthful overexposure to his self-acclaimed and self-evidenced victimology. One could say it's truly "deplorable." The #JussieSmolletHoax as Jussie Smollett will be remembered in years to come is only the latest where politics and politicians weave their narratives in concerted plans to declare victim hood, theirs or others with the singular objective to have them elevated to higher office. Smollett isn't a lone assassin. He's had plenty of company in recent years. 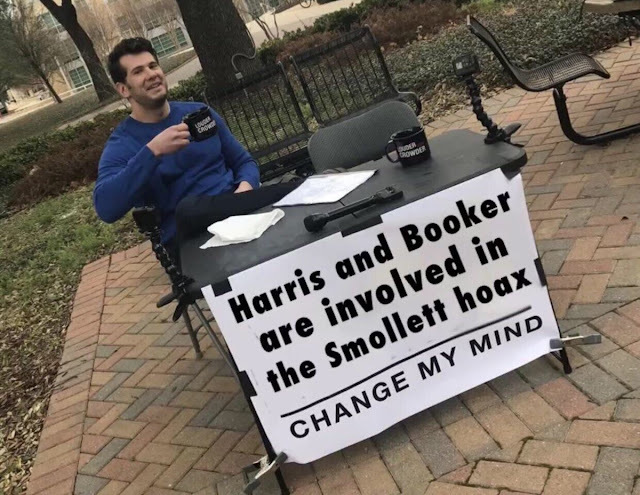 Questions are being raised about his rehearsed, staged hoax and how it may connect to anti-lynching legislation passed in the Senate by US wannabe presidential candidates Cory Booker and Kamala Harris. Impeccable timing that. The political consistency of these hoaxes and their frequency have surfaced in almost every aspect of life nationally in recent years. From university settings and now to the little screen, it's their exposure that's telling. With the Jussie Smollett Hoax, an actual hate crime directed against tens of millions of Americans to the Ravi Terror Flyer in the 2017 Hoboken mayoral election, each features similar commonalities and similar desires. The outcomes are new with the most recent hoaxes backfiring on their creators but the motive is always the same. When every action and every individual is viewed through the prism of being willful political operatives for the "cause," truth is often the first casualty. The epidemic of hoaxing, national and otherwise have become common fodder. Smollett faces up to three years in prison for his filing a false police complaint but that's Chicago. In Hoboken, it would be unthinkable that the political use of a criminal accusation would face actual justice. This editor faced one after another fake criminal complaints over years and no judicial or law enforcement authority ever asked if a counter-complaint would be forthcoming when each including one courtesy of the noxious Beth Mason was evidenced as, wait for it... a hoax. Hoaxing for political power using the public microphone at a City Council meeting and running a political operation out of the mayor's office to bully council members where members of "the public" also sign off on tepid if not outrageous "ethics complaints" has become the latest norm. When exposed in unseemly political operations, more political operatives rise to declare themselves victims. Newly signed up tough guys who allow their puppet masters to declare them wussies for political gain. We haven't even mentioned the Ravi Terror Flyer hoax. You can't handle the truth you were turned into a chump in the mayor's race. Your head might explode if that truth comes out. Or is it when? Hoaxing is so in, it's become commonplace. From the #RussiaCollusionHoax, the #CovingtonKidsHoax, the Kavanaugh Hoax and now the Jussie Smollet Hoax, the motives behind each are packaged in victimology. Does the simple truth make you mad? Not at the hoaxers but at a statement of the truth? Mash up: Jussie's crying performance on TV vs. the Chicago Police Dept. Hope you are all safe and warm today. If you are itching to get out, feel free to come to the City Council meeting tonight at 7pm at City Hall. Alternatively, you can watch online HERE (the link will show promptly at 7) or on the Hoboken Facebook Page. 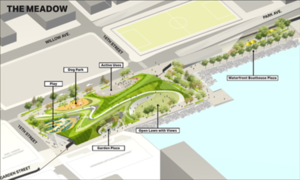 On a relative basis, tonight’s agenda is light, but there will be a brief presentation tonight at 7pm on the Rebuild By Design – Hoboken Cove Park (or as I refer to as Harborside Park). I recommend everyone to tune in if they can. I asked that this connection with the City Council be made. This is an odd process in that we have non-Hoboken agencies creating a large open space for Hoboken. Don’t get me wrong – I am 100% supportive of the project and think AECOM and DEP are doing amazing work. But after going to the recent meetings, I came to realize that for this part of RBD specifically, there needs to be more conversation between the RBD project team and those who are tasked with ensuring resident safety (the entire governing body) and those who ultimately approve the tax levy (the city council). What do I mean? I go back to my concerns raised in my email last week: 15th and Park as a main park entrance (too dangerous) and the potential cost and effort required to maintain these beautiful, yet complicated designs (may break the bank). This project has a path and timeline of its own – dictated by HUD - that has to be met. The project requires certain easements with the City, among others, to build. So getting together now, so we can all be on the right path, will make a great outcome more certain. If you don't see the value between commercial and residential, think about your long bus or ferry line, or how long it takes you to get out of Hoboken by car in the morning, or the sports team that your child is on that has 20 kids for only 5 spots, or all of those businesses on Washington street that are failing because they have no daytime business. More residential adds to all of those issues. More commercial would mean local jobs, complementary commutes, and a daytime population that will help support all of our local businesses. Back to why is this “kinda related”? Because there seems to be little if any coordination between the North End planning process and the RBD Park planning process. And we learned about a MAJOR MAJOR MAJOR NHSA project (a positive one) involving the new BASF Park and raising roads in the North End that also doesn’t seem to be coordinated with either project. We raised this last night and encouraged better linkage and I have already reached out to Mayor Bhalla and suggested this to him as well. This was definitely longer than what I planned tonight! What else is new... so much going on and so much to say and share. As always please forward this to anyone you think may be interested and feel free to reach out via email, text or phone (201-208-1674) about this or anything else important to you. Alert: winter weather advisory is in effect for the entire area Wednesday afternoon through 6 am Thursday. The advisory begins at 12:00 pm Wed.
A winter weather advisory is in effect for the entire area Wednesday afternoon through 6 am Thursday. The advisory begins at 12:00 pm Wednesday for NYC, northeast New Jersey, Lower Hudson Valley, and Nassau County on Long Island, and at 3:00 pm Wednesday for southern Connecticut and Suffolk County on Long Island. • Light to occasionally moderate snow is forecast to develop Wednesday afternoon and gradually move across during the evening commute. The snow will transition to a wintry mix across NYC and Long Island around 7 to 8 pm. The wintry mix will lift north across the region through the rest of the night. A light glaze of ice is possible as the precipitation becomes a wintry mix after the evening commute. The precipitation will become plain rain for much of the region after midnight. Light freezing rain or drizzle may continue across the interior. 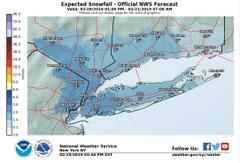 o Snow Accumulatio n: Total snow and sleet accumulation of 1 to 3 inches is expected across much of the area. Amounts may be closer to an inch across eastern Long Island and southeast Connecticut. o Snowfall Rates: Snowfall rates of up to one half inch per hour are possible during the evening commute. o Ice Accumulation: A glaze of ice is possible with a few hundredths across the interior where freezing rain may occur for a longer duration overnight Wednesday. o Travel will be hazardous during the Wednesday evening commute. Hazardous travel will continue Wednesday night, especially on secondary and untreated surfaces. Governor Murphy has declared a state-wide emergency declaration, Colonel Callahan (NJSP-OEM) has declared a commercial traffic ban on several state roadways. Please stay off roadways until storm has passed and road crews have an opportunity to clear roads. A glimmer of hope at Union Dry Dock? A tweet by the Hoboken second ward councilwoman may offer the first glimmer of hope on the contentious battle over Union Dry Dock. New York Waterway set up for operations and is flying the flag over the property but the reason for their placement south of Weehawken moving to Hoboken may not be what some were told. The premise was NY Waterway had been bumped off the property in Weehawken and needed a new home. Is that actually more myth than fact? Anyone tell Governor Phil Murphy that may not be the case? Is our mayor talking to him about it? Talking Ed Note: Perhaps the Union Dry Dock story isn't so inevitable after all. Almost a year to the day on a Friday night, Mayor Ravi Bhalla proudly announced his second job with a Republican law firm. What followed the same year, tens of thousands rolling down the hill to his Republican law firm employer totaling $70,000. The figure surpassed his $60,000 base salary, what some deemed a no show job. 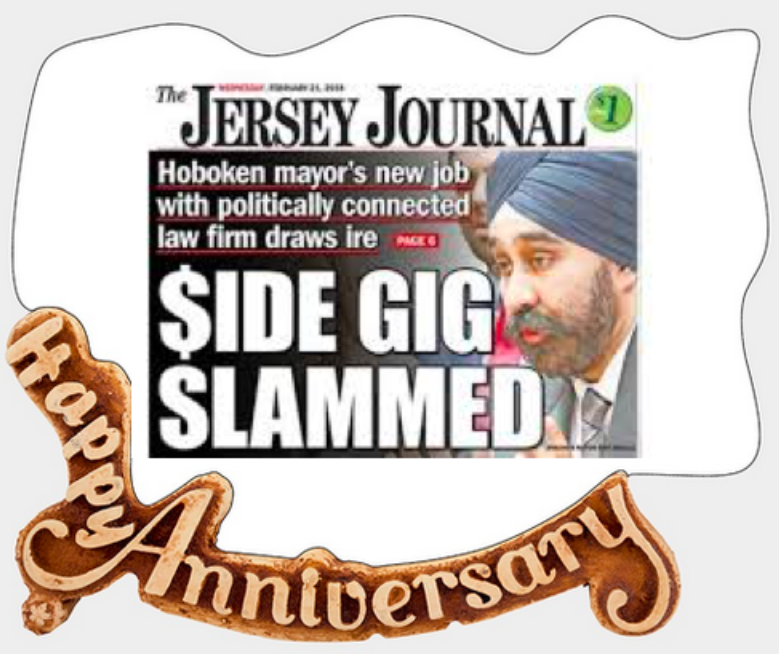 The Jersey Journal would cover the big news putting Ravi Bhalla on the cover. Invariably, Hoboken residents have been incensed when the topic of Ravi Bhalla's side hustle comes up. Talking Ed Note: If you want to participate in the joy with Ravi on this important milestone, feel free to copy and paste the link on his and/or City of Hoboken Facebook or Twitter. UDD Clash, Nixle tells Hoboken to take "disciplinary action"
A clash between the City of Hoboken and NY Waterway at the scene of the former Union Dry Dock took place yesterday late afternoon. “Stop work at once pertaining to construction, alterations or repairs on these premises known as 901 Sinatra Dr.,” the order says. Few details were made clear at the scene, as no one appeared to be on the ferries at that time and no sort of actual construction was evidently taking place. Mayor Ravi Bhalla and Second Ward Councilwoman Tiffanie Fisher were on the scene at the time of the action and posted to twitter on the matter. The right action today by @RaviBhalla . All parties have been working together to find a solution and @ridetheferry decided to act in bad faith and without necessary approvals. @HobokenRPW . 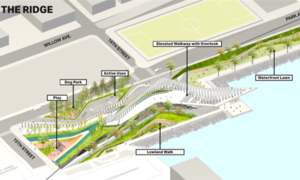 The clash is the latest in the disagreement over NY Waterway using the former Union Dry Dock as a maintenance site and City of Hoboken which wanted to see UDD converted to additional waterfront park space. It"s unclear how the latter is possible short of intervention from the governor's office in Trenton. On the political front, Nixle which turned into a less than savory political vehicle in the mayor's office earlier this year issued a letter giving a message to the City of Hoboken, the mayor's office, the City Council and the Hoboken public. To encapsulate, Nixle was clear it's in the business of being in the generic announcement business. They are not unclear about wanting to stay out of dirty politics in Hoboken. Their letter references numerous public complaints. A resolution passed overwhelmingly by the City Council 7-2 stating it "respectfully requests Mayor Bhalla to stop the practice and no longer allow any employee to abuse the Nixle service." Nixle and its parent company Everbridge say leave us out of it writing it "makes no determination" as to the violations cited. They add they won't opine on a letter out of the Corporation Counsel's Office siding with the mayor's office but Councilman Peter Cunningham did at the last council meeting, disagreeing with the conclusions drawn. "... it is the City's responsibility to take any corrective/disciplinary action against any" user posting/sending "prohibited communications." They qualify further they may act in the future on matters "flagrant" and "disruptive." Talking Ed Note: Happy Valentines to all and to all my friends. Horsey loves Blue Bird. Councilwoman Tiffanie Fisher: "Monarch, RBD Meeting tonight, Policing & End to Nixle-Gate"
More RBD, More input needed - Meeting Tonight at 7pm! MONARCH I received several inquiries on Monday about observed construction activity on the Monarch site. Namely that there were a couple of small backhoes that seemed to be removing trees and moving some dirt. I reached out to the City and was told that in January 2018, over a year ago, Shipyard “pulled permits” to begin (only) restoration of the pier. This came as a total shock to me and many others who have been closely involved with this, including Fund for a Better Waterfront and other City Council members. 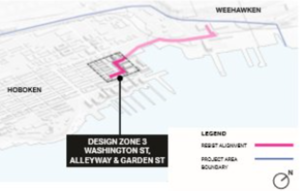 I know that the mayor continues to actively work with the owners to try to find a solution that would stop Applied / Ironstate from building on the waterfront. Given the timing of the activity, and that the DEP usually restricts any water work between March and June, I am hopeful that this is only a "shot across the bow" and more meant to encourage settlement discussions while continuing to threaten building. As I mentioned before, in January the City Council passed a resolution for a contract with an appraiser to do an economic valuation of the site as well as a City-owned property (DPW site) that will hopefully help facilitate settlement discussions. I am told the mayor will be sending out an update to residents. RBD - MORE AREAS, MORE INPUT NEEDED! Tonight is the next design meeting for another part of the Rebuild Design Project on the north end - Zone 3. Tonight from 7:00-9:00pm at Elysian Charter School, 1460 Garden St. This is the area that begins at 15th and Garden, and works its way South through the alley behind the parking garage continuing across Bloomfield and then turns onto Washington St. running past Soul Cycle, crossing 14th near Madison, and ending mid-block just past Bin 14. Different than Zone 2, which is a park, this will be more of an urban type design weaving through and around buildings so please come out and see what they are proposing! Thank you to those who came out last week to participate in the design for the new park at 15th and Park – we had about 40 people on Monday and then had about 70 people on Thursday! Safety - Not having a main entrance be at the corner of 15th and Park and providing fencing all along 15th and Park to provide a physical separation between the park and two main thoroughfares (think Central Park). 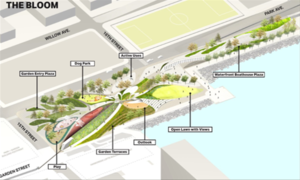 More open green space –Much of the feedback received was that the designs do not provide enough green space, have too much little-used plaza (concrete) space and in particular do not preserve the current uses of the park. Cost to maintain – Design the park to be both beautiful, but easy and cost-effective to maintain. The design team has already been taking in this feedback and one of the project's leads said to me that they were thrilled that so many people came out and didn't care what the feedback was, but was just happy to get so much input! More voices definitely matter! I do want to give credit to them and say that I think they have done an amazing job getting to this point, and have to date tried to incorporate public feedback into their designs. So I am confident that further feedback will take this to a great outcome for Hoboken. Meadow - meandering path up and over a hill that hides the structure. Least complicated design. Ridge - a path to an elevated walkway/plateau with a shade structure; includes a ridge/wall that gives the look and feel of the palisades. Bloom - a collection of distinct areas in a bloom design with a lot of concrete walkways; this one, although beautiful, feels choppy and difficult and costly to maintain (IMHO). Hoboken Police Chief Ken Ferrante was interviewed last week by Hudson County View. It is a 30-minute interview and it is as interesting as it is informative. As I said to both Chief Ferrante and HCV’s John Heinis after watching it, it was great questions and great answers. They cover most topics that I hear about from all of you including, among others, pedestrian safety, the recent drug bust and stabbing, response to potential terrorism threats (and HPD’s coordination with statewide and federal agencies), concerns about enforcement of marijuana once it is legalized and where the line is drawn between Hoboken PD and Hoboken Parking Utility. I really would encourage ALL of you to grab a cup of coffee or other drink of choice and take the time to watch this great video in its entirety. A reminder of the important contact information for Hoboken PD (and that if you see something send an email!). Finally, as I described in my January 16th email, there were concerns that Nixle, Hoboken's community alert system, was being used by members of the mayor’s office for political purposes specifically attacking certain council members – including me. Seven council members voted yes (two voted no) on the resolution I sponsored requesting the mayor to direct his team to end this practice. And six of those seven council members joined me in filing a complaint with Nixle that the City was in breach of Nixle’s Terms of Service which prohibits political and harassing communication. Yesterday I received from Nixle a copy of the attached letter from Elliot Mark, SVP and General Counsel of Nixle that was sent to the City addressing our complaint. The main and most important message is in the first paragraph reminding the administration that they cannot “use any of the Services for political…purposes.” They go on to say they do not have any reason to disagree with Hoboken corporation counsel’s legal opinion, falling short of saying affirmatively that they agreed with it. I do believe there is reason to disagree with Hoboken corporation counsel's opinion who was probably conflicted on the matter, but I appreciate that the issue under debate - what constitutes political attacks and harassment - is subjective in nature and would have been difficult for Everbridge / Nixle to evaluate further. That being said, I was happy to see Nixle state that if the problem continued and became more flagrant and systemic, they would step in. As you know, I personally am a fan of pushing information out to people and am happy to see that Hoboken's new communications manager is using the system more frequently to inform residents and that since the January 10th and 11th incidents, we have not seen any more overtly political statements issued using the Nixle system. I think this is a win-win for all of us. At the end of the day, I am hopeful that as a result of all of the advocacy - including those of you who also reached out to Nixle directly - that we will see our community alert system used only in ways that benefit all of us. According to the mayor's office, fully 90% of the Washington St. project is complete. That's the good news even with winter, there's been some sidewalk work on certain days. The bad news is the final bill. It's likely to come in over $20 million and far past the deadline. How that works out remains to be seen. There's talk of added funding being paid back for missing deadlines. 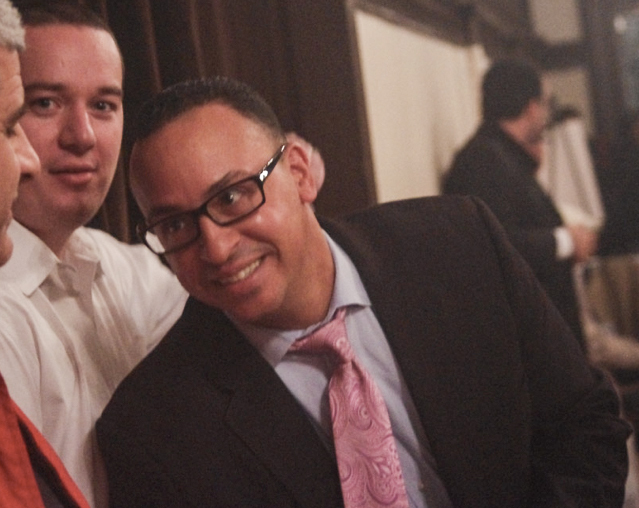 Last week, the imprisoned former fourth ward councilman Chris Campos received more bad news. The state agency overseeing campaigns, NJ ELEC, hit him with campaign fines for $22,000. When they chose to do it is what's striking. Campos is in federal prison in Pennsylvania for his role in a $7 million illicit car loan scheme. The campaign violations stem back more than a decade to 2007. Guess who remains in violation to this day and is a BFF of Campos? That would be one Carmelo Garcia. Last seen, Garcia, he of the ethnic cleansing lawsuits and deceased attorney never filed any campaign report on his 2015 sixth ward council race. Zero, zip, nada, nunca. How does Mister Carmelo continue to not only get away with it but profit? the report NJ ELEC hit him with $22,000 in fines stemming from violations in his 2007 council campaign. That's a far more complex and detailed story for a federal informant day. Not today. More on all this with the heat being felt in the Mile Square City as the Feds tighten their grip on Hoboken election fraud and related less than legal enterprises. No one is to whisper let alone discuss any of this or the New Year's Day gift Ravi Bhalla handed the Russo Clan when former mayor and felon Anthony Russo was welcomed back into the mayor' office as the first order of business. Ravi Bhalla and Michael Russo, they understand each other. They understand government bidness. It's why the Ravi-Russo Alliance continues to prosper and remain a threat to Hoboken and the remnant of good government leaders in Peter Cunningham, Jen Giattino and Tiffanie Fisher. The Armageddon of Hoboken past, present, and future corruption lie ahead as all the pieces are in place for a full-out war heading to the November ward elections. The rest of this story is MSV Premium. Members will receive issue by tomorrow. Those who wish to enroll may do so at the link below, no Paypal account required. Apparently, low information voters and low information councilmembers are fine with the ultimate act of cynicism in putting Councilman Michael Russo on the hospital board. Yes, the same hospital he with other members of MORTe tried to kill in 2011. Councilwoman Tiffanie Fisher led a come from behind effort from the good government trio with City Council President Jen Giattino to see Councilman Peter Cunningham appointed over Russo. Back with more but first, time to go back into the Horsey Wayback Machine. There was no better coverage on the savage battle to take down Hoboken, the hospital and then blame former mayor Dawn Zimmer. 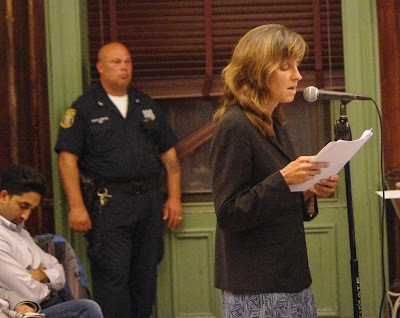 From the archive, live coverage at the City Council meeting on September 21, 2011: SUICIDE MISSION. Councilwoman Beth Mason said this bond ordinance was "throwing money away." She said her demands also had not been met. (State regulations govern two of them and she conveniently overlooks it.) Additionally, she complains about the nurse's union who took a pay cut. She actually disparages the bondholders, re: the Hoboken taxpayers who will be made whole. Russo in full politrickin mode is claiming to be speaking for the taxpayers. And he's being applauded by a group of Old Guard people who don't pay taxes. You can't even put a price to this level of cynicism. He calls the mayor "a grifter" and is applauded by the Old Guard rabble who are cutting their own throats. BA Arch Liston corrects the record to the assertion by Councilman Russo that the City has a $5 million surplus to utilize. Russo then goes out of control and refuses to allow others to speak. Talking Ed Note: Councilman Jim Doyle, what the hell is wrong with you? After Councilwoman Tiffanie Fisher nominated Peter Cunningham, the resolution sponsor Emily Jabbour announced she would abstain from voting. She said due to her involvement with the hospital on the matter. She's not precluded from voting but removed herself although there's no conflict. MSV reached out to her and is awaiting comment on the effort to have Russo appointed. Corporation Counsel Brian Aloia interjected as a point of interest prior to the vote, the hospital, CarePoint, retains the authority to decide on any council nomination sent to them. 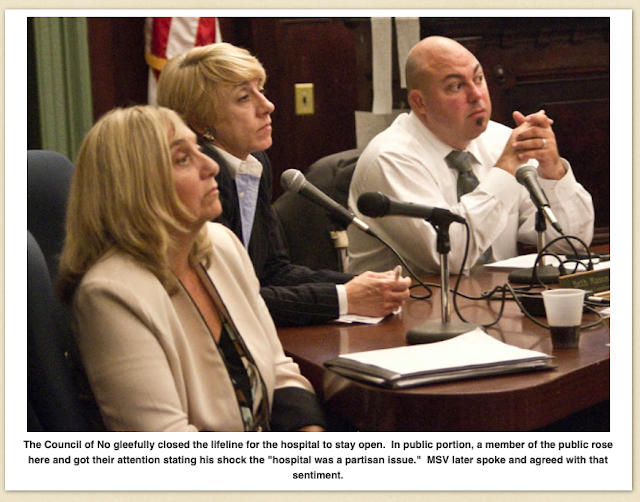 It would have been quite embarrassing to see the City Council put up Russo and then the hospital to respond back "NO! What are you smoking?" The Hoboken Municipal Committee Executive Board and the Hudson County Young Republicans announced today their launch of a joint Lincoln Dinner on February 26that 7pm in Lola’s Tapas Bar, 153 14th St, Hoboken. The dinner at Lola’s Tapas features a long list of fine food as well as wine, beer, and sangria. Tickets, which are the low cost of $60, can be purchased here. 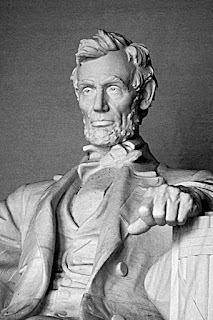 Lincoln Dinners, an event done by Republican Committees and clubs around the country, honor the first Republican President in history, the Great Emancipator, Abraham Lincoln. Councilman Mike DeFusco scheduled a fundraiser earlier this year. Then, Mayor Ravi Bhalla scheduled a State of the City event on the same night. Who do you think is not invited? Should we expect another PIZZAGATE? The following report is an accumulation of investigative efforts, analysis, and opinion now into the tenth year on Hobokenhorse.com covering Hoboken government, politics, and corruption. The opinions as stated here are the sole responsibility and copyright of MSV. © 2019 All rights reserved. The newest exposure of Mayor Ravi Bhalla's office in last week's Hudson Reporter story on payroll hijinks and the political attacks on the City Council opens the door to further examination on the abuse of taxpayer monies there. Whether it's abusing the use of the Nixle system, the City of Hoboken social media or the public's microphone at City Council meetings, the trio of political operatives paid over $300,000 annually in the mayor's office are doing political business for Ravi Bhalla not the business of the people. Let's revisit the original exposure when Mike Donnelly was first discovered connected to Head Face Puncher John Allen in Ravi Bhalla's office last summer. The revelation after his attacks in first ever council appearance and then almost immediately was compounded with him signing a legal ethics complaint filed in Trenton. The operation has been led out of the mayor's office by John Allen who is a lawyer with Ravi Bhalla's blessing. The odor is errily similar to the earlier issued Ravi Terror Flyer. Councilman Mike DeFusco blasted the political operation as the photo Ravi Bhalla's office forgot to scrub linking Donnelly to John Allen first appeared here. After that unplanned revelation, complete and utter silence followed from the mayor's office and Donnelly smartly dropped out of sight. There are 55,000 people in Hoboken and some pictured here but there's only two connected to the political operation of attacks against the City Council members at their meetings pictured. Oh, those magical coincidences. With the Hudson Reporter story fueling further scrutiny of the political attacks last year on the City Council orchestrated out of the mayor's office, former Bhalla for Mayor campaign manager, Vijay Chaudhuri attempted damage control from his new communication manager position in the mayor's office. He reportedly tried to get the Hudson Reporter to put Mike Donnelly into their story. That didn't work so after the story came out last week, only hours later a letter immediately appeared from, well at least signed in the reappearance of Mike Donnelly. That's not a coincidence and neither are the talking points of whiney complaints from Ravi Bhalla's political face punchers. For anyone who wants to go out and speak against corruption in government at a Hoboken City Council meeting – beware. You may have a City Council member viciously attack your character like Tiffanie Fisher did to me. Note the overblown political ham-fisted tone. Getting nabbed in a failed political operation last year using the public's microphone at council meetings doesn't make one a victim. It makes them damaged goods and appear wimpy for allowing John Allen & Co. to use them again when caught dead to rights. The phony corruption angle is a nice touch since the letter clearly avoids the recent revelations of shady money deals involving Ravi Bhalla. Here's irrefutable proof and a terminal error. Exactly when did Donnelly allegedly hear this listening to a council meeting? Let's help Donnelly out here as Ravi Bhalla's political operatives did him another terrible disservice. The allegation fails and goes down in a flaming heap because it simply doesn't exist. No one is going to produce this allegation on any City Council video. Ever. was the only no vote for our Hispanic director of environmental services; and was the only one not to vote in support of our first African-American director of community development. Yet another major face puncher error out of the mayor's office. They're literally complaining about two meaningless votes having no bearing on an outcome. The letter writer, not Donnelly, claims this was the impetus to his getting involved. When? Donnelly had already departed the scene last summer when MSV published his connection to John Allen in the above photo. These two inert votes followed months later, another obvious tell that it's the face punchers' gripe out of the mayor's office. They desperately can't contain their desire to eliminate a good government voice on the City Council in Councilwoman Tiffanie Fisher. The objective is to eliminate good government voices. That the reference to these two innocuous votes months after Mike Donnelly had disappeared from the scene additionally proves the letter is not his and is not credible. The citation of two less than minor votes however came from John Allen friend no. 2 who followed Donnelly later. That political operation out of the mayor's office was thoroughly decimated with the appearance of the next friend John Allen sent in and had report to him AT HIS HOME immediately after. It was the second friend of John Allen who dropped a dud at a later City Council meeting but didn't make it 24 hours before being burned. John Allen friend no. 2 was seen leaving mid-meeting and going right to the door of John Allen. Donnelly couldn't have claimed this as a reason to insert himself as these talking points from the mayor's office weren't his and came long after he went to ground. These are not the sharpest face punching political operatives, are they? After expressing my First Amendment rights to speak out on issues I found to be important, I opened my inbox days later to see thorough research done on me, including my age, profession, and misleading — and in some cases, downright wrong — personal information about me published in an email by Tiffanie to her constituents. I found this to be a vicious attack on my character and a blatant act of political intimidation, which is something that I will not stand for. No rule against using your right to speech, no matter how badly it turns out. Did Donnelly really sign off on this manufactured letter from the mayor's office? He might have sat this sorry embarrassment out. No research needed with an online photo. John Allen screwed Donnelly last year and is royally screwing him over again. Her insinuation is that because I’m young, not a lawyer, and haven’t been active before, I don’t have the right or ability to speak my mind on her actions. As her constituent, it’s not just mind-boggling and insulting, but I believe this is clear intimidation by a public official and should be called out for what it is — bullying through scare tactics. Speak as much you like; the clown show's in town but political operations go sour when exposed. That's Donnelly's signature on a tepid complaint filed in Trenton. Will he be filing against Ravi Bhalla for his serious financial transgressions? As you can see, John Allen is no super lawyer and no super political operative. Getting busted last year in this political operation isn't an act of intimidation. It's exposure of a political hit job like this letter coming out of the mayor's office. The intended objective is political intimidation against Councilwoman Fisher and by extension any and all council members. These kinds of stunts backfire fast when evidence surfaces as documented here. 1. Attempting to strip the mayor’s office of one staff member, despite a legal opinion from the law department stating that it was improper to do so. Why Ravi Bhalla's face punchers insist on this previously destroyed canard is something only they can explain. They won't. The potential position elimination was for one of the three face puncher positions if someone leaves in the future. Only a mayor's office face puncher could be so dumb to repeat this when it doesn't exist. Councilwoman Fisher has a superb record on and off the council unlike the weak sauce offered in this letter clearly created by Ravi's nasty face punchers. No one should lay this at the feet of Donnelly; these face punchers are not self-aware. There must be accountability in the 2019 budget. This is occurring due to the bloated abuse of $300,000 in Hoboken taxpayer monies out of the mayor's office. 2. Refusing to reimburse a staff member in City Hall for the cost of pizza during a community event. PizzaGate! A bottom of the barrel complaint only a face punching political operative could love. It's utterly insipid as Ravi Bhalla attempted to spend $130 of taxpayer money on pizza for his self-declared private meeting. Based on the far more serious news about Ravi Bhalla and shady money deals in recent days, you would have thought a lesson would be learned prior. 3. Fundraised for an alt-right local blog, which posts disgusting and vile things about residents, including using the word “retard” as a nickname. Hit the eject button and land squarely right into crazy Nancy Pincus Sybil territory. These are some of her favorite lies. This is not the failed rhetoric of anyone other than fabricating Ravi Bhalla political operatives in the mayor's office. It's an obvious attempt at political retaliation for being exposed in a series of corruption stories appearing here on MSV. That's it? A dispute quickly resolved more than a year ago about appointments to one Hoboken board? This is the last drink in a string of failure coming from Ravi Bhalla's political operatives in the mayor's office. It's a minor difference under the bridge only a Ravibot could hold dear. This letter is clearly manufactured from the crybaby face punchers out of the mayor's office. As evidenced, it's very likely, Donnelly never crafted a single sentence. It's dripping with resentment from the self-entitled face punchers against Councilwoman Fisher. These are tired, flacid and fabricated complaints the Ravi Bhalla face punchers tell each other in the mayor's office. It's their laundry list of electioneering not organic concerns of any John Q Public and certainly not one Mike Donnelly. Vijay Chaudhuri was contacted Sunday to explain his role in this hot mess. Both he and his fellow face puncher political operatives and Ravi Bhalla have remained silent since his dirty money deals that came out a week ago and the dirty money hasn't stopped surfacing since. They can't muster any defense about Bhalla and $70,000 in local government contracts going to his "second job" and his illegal PAC money. These actions are indefensible and everyone knows former mayor Dawn Zimmer would never condone it nor any good government advocate in Hoboken. That of course would include Councilwoman Tiffane Fisher among others. Be ready, these face punchers are getting ugly. Talking Ed Note: No one would ask friends to reinsert themselves into a previously destroyed political operation. Of course, the victims, John Allen's "friends" didn't know enough to realize that exposure would happen almost immediately. Then again, these overpaid Ravi operatives putting these poor guys up to this are beyond self-indulgent, self-entitled, woefully narcissistic and arrogant. 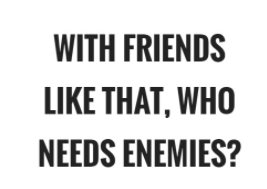 Any friend deserves better. 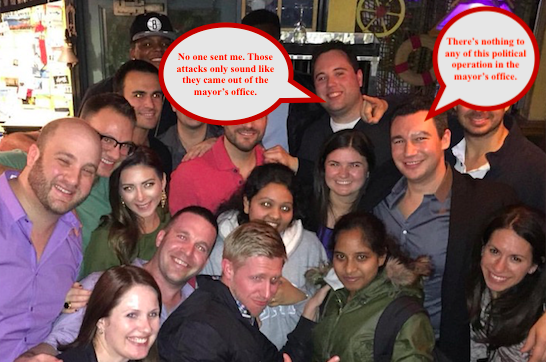 Both of these exploited friends show the state of the mayor's office is corrupt.